LAST TWO PRINTS REMAINING (April 2018). This painting by Tanka Bahadur Bal Tamang depicts Avalokiteshvara, the Bodhisattva of Great Compassion, in the androgynous form of Kuan Yin, who can appear in either male or female form in the Chinese and East Asian Buddhist traditions. The name Kuan Yin (or Guanyin) is an abbreviation of Kuan Shi Yin or Guanshiyin, meaning ‘Perceiving the sounds or lamentations of the world’, which is possibly derived from a slight mistranslation of this deity’s Sanskrit name into Chinese. Avalokiteshvara as Kuan Yin is now the most popular deity of the Chinese Buddhist pantheon, where he was first represented as a male deity. However, during the Yuan Dynasty (1279-1368) Kuan Yin progressively began to appear in androgynous or female form as a goddess. This accords with the Lotus Sutra, which describes Avalokiteshvara as a bodhisattva who can manifest in any human or non-human form or gender. Kuan Yin’s sacred abode is Mount Putuo or Potalaka, an island to the south of Shanghai that bears the same name as Avalokiteshvara’s Indian abode of Mount Potala. From China the cult of this popular ‘Goddess of Mercy’ spread to Korea, Japan, Vietnam, Thailand and Indonesia. In Japan Kuan Yin is commonly known as Kannon, and is especially associated with the Pure Land traditions of Amida or Amitabha Buddha, where fortunate disciples take rebirth in genderless or asexual human forms. Kuan Yin has thirty-two or thirty-three principal aspects, which include: Water-Moon; Willow-branch; White-robed; Sutra; Rock-cave; Dragon; Lotus-leaf; Fish-basket; Flowing-water; Blue-throated, and her aspect as the longevity goddess White Tara. Porcelain statues of White-robed Kuan Yin are frequently found in museums or emporiums, and in this form as the ‘Bestower of Children’ she was very popular with the Jesuit missionaries in China, who identified her graceful child-holding appearance with that of the Virgin Mary. 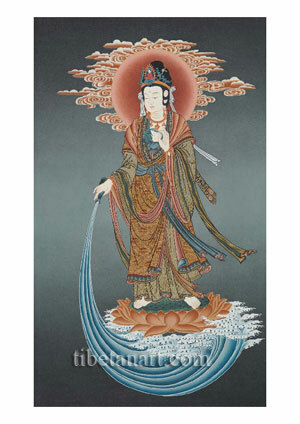 In this painting Kuan Yin appears in the androgynous form of a bodhisattva with feminine features but with no breasts. She stands upon the seed-head of a red lotus that floats upon the swirling waves of the water that she pours from the flask or vase in her right hand. This pure ambrosial water flows in a never-ending stream, representing her ability to alleviate the thirst of hungry ghosts or tormented spirits, and to purify the defilements and sufferings of all beings. The waves also represent her ability to rescue those in peril on China’s South Sea. With the fingers of her left hand she holds a sprig of willow in front of her heart, with which she can bless or consecrate by sprinkling water as the ‘dew’ of her compassion. The weeping willow has many healing properties in Chinese medicine. From its bark aspirin was derived, and its leaves frequently replaces Avalokiteshvara’s lotus as a principal attribute of Kuan Yin. Kuan yin wears various robes or garments of richly embroidered Chinese silk, some of which are fastened with flowing silk belts. A long red and green scarf is draped around her upper body and arms, and a silk valance hangs behind her back. She wears the golden ornaments of bracelets, earrings, an amulet necklace, and a golden tiara that bears the lotus-mounted form of Amida Buddha as a seated white figure wearing red robes. Kuan Yin’s white face is moon-like with two bow-shaped eyes, and her black hair is piled up into a large bun or topknot that is bound with a long white ribbon. Clouds adorn her red halo to indicate her great stature as a goddess of mercy who occupies the vastness of space between the sea and sky.